In 186os the Austrian mining engineer and professor Friedrich (Fritz) Arzberger constructed one of the early column adding machines with keys (after the pioneering machines of of James White, Luigi Torchi, and Jean-Baptiste Schwilgué), although it possess only two keys—for 1 and for 3. The device looks like an experimental work and was probably a small plaything for Arzberger. 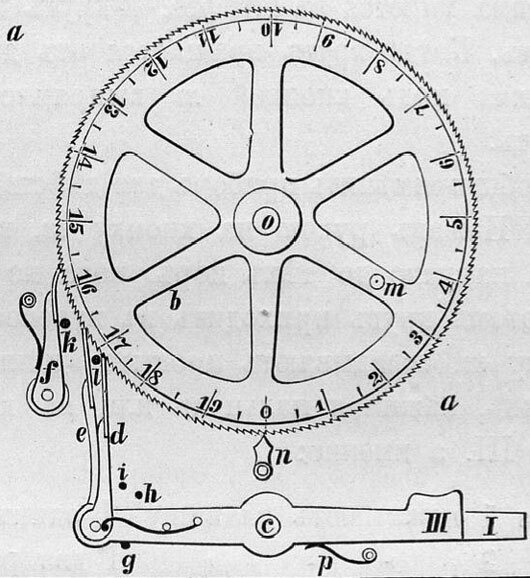 The device (Arzberger's Addirmaschine) was initially presented in the journal Schweizerische Polytechnische Zeitschrift, Volume 11 (1866), Issue 2, pp. 33 and 34, and was later in 1896 described by Фон-Бооль, in his book "Приборы и машины для механическаго производства арифметических действий". The device of Arzberger (see the lower drawing) consists of a plate (marked with a), which can be put in a tilted position using a wedge. On the plate is mounted a rotatable big 200-teeth ratchet wheel (b). The 2 keys (I and III) are mounted on a common axis (c) and the ending-rods (d and e). The spring (p) returns the key to the initial position after depression. The fixing mechanism is provided by means of a spring and a fixing arm (marked with f). The movement of the keys is limited by means of the pins (g, h and i). In order to avoid the over-rotation during a fast keystroke, are provided 2 additional pins (k and l). One of the spokes of the big wheel (b) has a opening (m), to which can inserted a metallic pin with a key on the outer edge and spring-plate on the inner edge. Using this pin, the wheel can be rotated and fixed to the desired position or reset (the spring is in a straight status during the normal keystroke operation, so it is not working). The null position is marked with an index (n). The entering of numbers is quite cumbersome. For example, in order to enter 8, the operator must press key III, then key I, then key III and to finish with key I.
Friedrich Franz Ludwig Arzberger was born on 14 November, 1833, in Vienna, a son of the German-born Austrian technologist Johann Arzberger (10.04.1778-28.12.1835) and his second wife Wilhelmine Josepha von Schwind (1798-1836) (a sister of the famous Austrian painter Moritz Ludwig von Schwind). Johann Arzberger was a talented engineer, professor of mechanics at the Polytechnic Institute and inventor (he was a pioneer of urban street lighting and in 1820 he constructed a steam car, which was determined to move on ordinary roads without use of rails), but unfortunately he died in 1835, when Friedrich was only two years old. The next year, 1836, died Friedrich's mother, Wilhelmine. The guardian gave Friedrich a good education. During his school years, Friedrich dealt with his father tools, with locks, watchmaker and carpentry work and worked in the workshops of friendly craftsmen. The Revolution of 1848 Arzberger spent with his uncle who worked as a manager of the salt mines in Bad Aussee. Friedrich also gained professional experience there. In 1851 Arzberger commenced his education at the Polytechnic Institute in Vienna and at Bergakademie (Mining College) in Schemnitz and Leoben, where he studied mathematics and chemistry in particular. In 1856 Arzberger graduated at the Mining College in Leoben. After spending some time from 1856 studying mines throughout Europe, in 1861 Arzberger became a control officer of the Imperial Mining and Metallurgy in Jenbach. In 1863-1866 he managed the operation of two blast furnaces in Vordernberg. In 1866 Arzberger started his career as a professor, initially in Bergakademie (Mining Academy) in Příbram, then he was a professor of mechanical technology in TU Brünn (now Brno, Czech republic), later until 1892 he was a professor in Vienna Polytechnic Institute. Arzberger was the inventor of an imaginative gravity escapement, and was an expert (he had several publications) on electrical clocks. Friedrich's brother (he had also a sister, Augustine Freiin von Schwind (b. 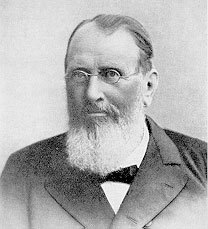 1829), and a half-sister, Ernestine), Moritz Arzberger (12.01.1827-14.03.1892) was also a very good engineer and inventor. Friedrich Arzberger married to Maria Arzberger (Westhauser) and they had 2 children—Johann (Hans) (26.11.1862-23.03.1946) and Wilhelmine Klara Auguste von Schwind (29.06.1864-27.11.1894). Friedrich Arzberger died on 3 August 1905 in Rindbach at Ebensee.